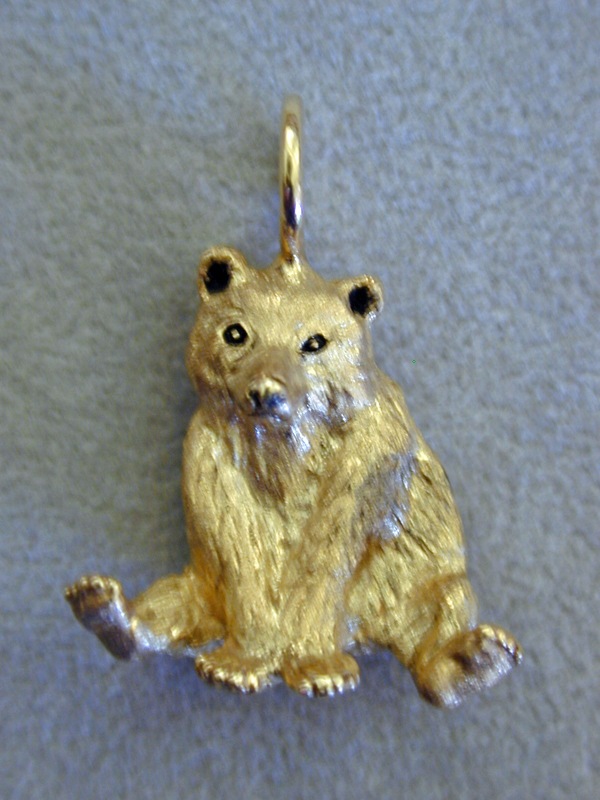 1 3/4" high, protrudes 2 1/2"
This bear comes without a 0.10 diamond. The 14 karat gold edition is open, and the 18 karat edition only has 100. <BR> Both are 28mm high. This Panda Pendant is available in an open edition of 14k and an open ediotion of 18k. This Panda Pendant is available in an open edition of 14k and an open edition of 18k.<BR> This is a heavy piece weighing 7 grams of 18k gold. The total of both the 14 and 18 karat editions of this panda is limited to 100. 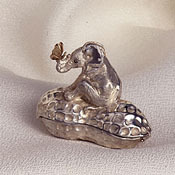 The panda comes with a 0.08 diamond, and measures 21mm at its widest.<BR> Sizes 3 to 9. Call for pricing on larger sizes. 5 1/4" high, 3 1/2" between screws.